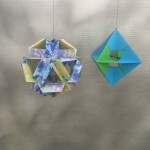 This workshop will introduce three methods for constructing modular origami designs to create unique, personal holiday. The techniques are easy-to-learn, and, once mastered, quick to make. This class is appropriate for all skill levels.